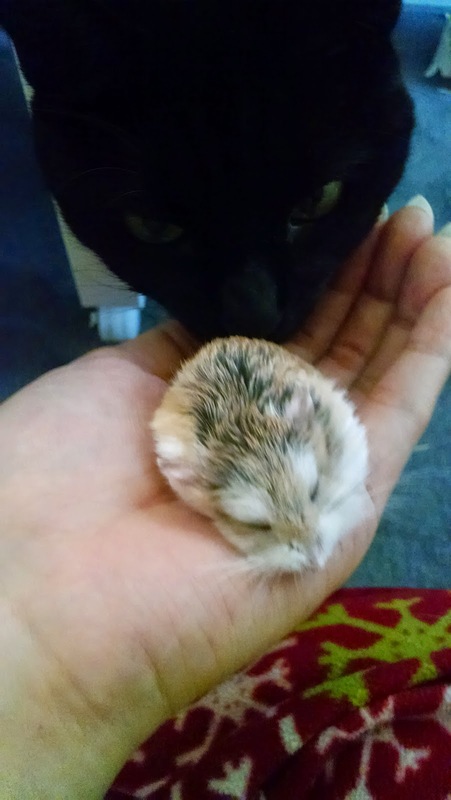 My sweet little Scully died recently. 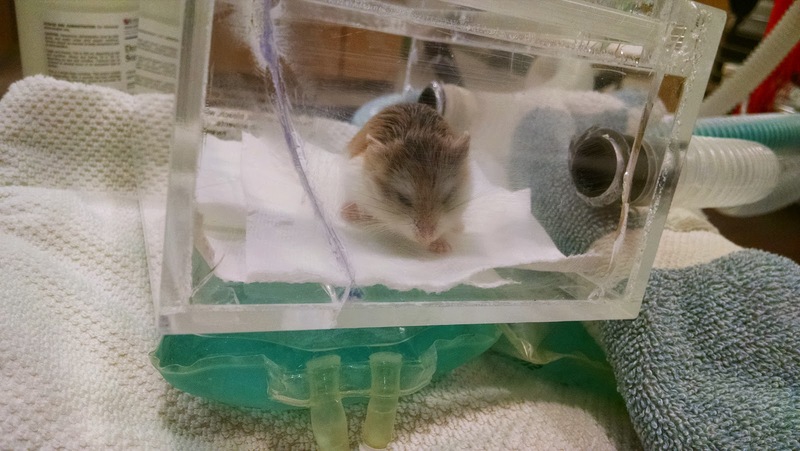 He had some sort of respiratory problem for the last few weeks of his life. I took him to the vet, who put him on antibiotics (Baytril), but he never recovered. I picked him up to syringe feed him, and he collapsed in my hand. I started crying and sat down with him. Tribble was so concerned about us that she came over and tried to lick him. I didn't let her, so she licked my hand instead, then plopped down against me. We decided to take him to the emergency room to see if anything could be done. The vet was certain that he was never going to recover, so it was time to let him go. My sweet boy. After his death, I became obsessed with building a new house for Mulder. Then it sounded good to document the process. Since the old houses were kept on IKEA Lack side tables, I decided to make the new house out of one as well. First off, a VERY IMPORTANT NOTE. Mulder is a Roborovski hamster, which is the smallest of the dwarf hamsters. When Scully died, he weighed 22g, or 0.78oz; robos are usually less than 30g, or 1.06oz. Other dwarf hamsters are slightly larger, and can weigh up to 2.5oz. Syrian hamsters, on the other hand, usually weigh 5-7oz. This house is a little less than 450 square inches, which is a decent size for a dwarf hamster, but would be entirely too small for a Syrian hamster. If you need a house for a Syrian hamster, I highly recommend that you consider adapting these instructions for a much larger table, such as the Lack coffee table or two or more connected Lack side tables. 2 IKEA Algot wall upright, 22"
I live near a plastics store that custom cuts a variety of plastics, so it was easy for me to get the pieces of acrylic. Since robos love to burrow, I wanted to be able to see the bedding. If you don't have the ability to cut acrylic, then I recommend coroplast, which is admittedly not clear, but very easy to cut with just scissors or a utility knife, and readily available at places like Home Depot. Due to the presence of a cat, the house needed a cover. However, again due to the presence of a cat, I wanted the cover to be see-through. If you don't need a see-through cover, it would be very easy to make one from coroplast. In that case, you won't need the wall uprights or the glass shelf. I used silicone aquarium sealant because I am paranoid and wanted the glue to be waterproof and animal-safe. Unpack the table, but don't assemble it yet. Flip the top upside down and cover this side with contact paper. The roll I'm using is 18" wide, so I just centered it. Turn the table 90 degrees and repeat. Attach the legs over the contact paper. Now, it's time to attach the mesh. I found it easiest to hold the mesh up to the legs, mark drill holes, drill, and then attach the mesh with screws. Attach the plastic over the mesh. I also used some glue between the plastic and the table. If you're using acrylic, you'll want to use a smaller drill bit on the table, and a drill bit that's one size larger than the diameter of the screw on the acrylic. Quick tip for drilling acrylic: use the lowest speed on your drill to prevent splitting and cracking. Grab the plastic corner protectors. These are easily cut with scissors, so cut a length that goes from the top of the leg to just over the plastic. I put a line of glue down the corner, then nailed a piece to each leg. The corner protectors handily cover the raw edges of the mesh. Once you're done with those corners, cover the top edges. Cut pieces that go from corner protector to corner protector, and nail those in place. Now these top raw edges are covered too. If you're using the Komplement glass shelf, place that on top of the house and line up the wall uprights on either side. I thought it would be best for there to be a tight fit, so arrange as needed and mark drill holes for the uprights. Note that the uprights will NOT be lined up against the outside edge of the table. You should have some short pieces of corner protector left. You'll need two pieces for this next step. Attach these remnants to the open ends of the shelf (the sides not next to the uprights). 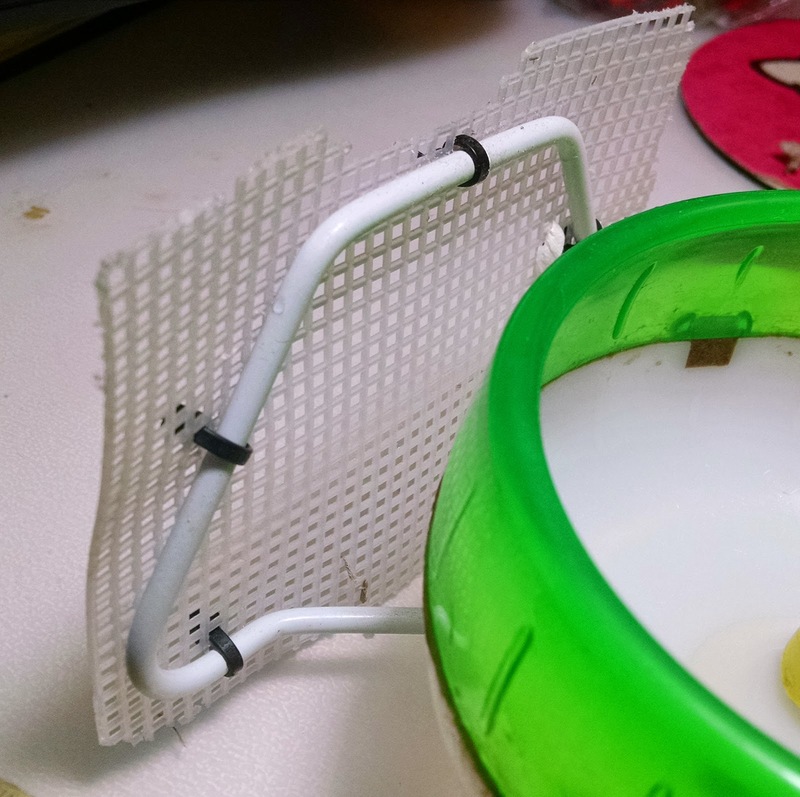 I realized that there was a gap between the mesh and the plastic that may result in escape, so I needed to attach those somehow. This contained both screws and appropriately sized bolts. Drill a few holes along the overlap of the mesh and plastic, and use those screws/bolts to close the gap. Make sure to clean the house to remove any stuff that may have fallen in during construction. Install all relevant housing stuff. Random tip: attach something solid, like a piece of plastic canvas, to the base of the wheel to help it stay stable on bedding. For the water bottle, I wanted it to hang inside the house, so I just snipped a few vertical wires and slipped the water bottle holder through those. Finally, add adorable tiny hamster. Mulder does not seem to hate his new house, anyway. Wow really interesting way to build a house for a robo! Looks awesome!